Why the Phi do all these planetary rotation ratios add to Fibonacci numbers? I’m confident that one day in the not too distant future we’ll look back at this post and wonder why we couldn’t see the obvious. But right now this is a total mystery. Oldbrew and I have been looking at the axial rotation ratios between neighbouring planets and planet pairs, with surprising results. Right upfront, we need to point out that these ratios between rotation rates are dimensionless, as are the Fibonacci numbers they relate to. So this is not mere ‘numerology’, or playing with numbers based on a particular measurement scheme. It doesn’t matter if you calculate rotation rates of planets in Earth minutes, hours, days or years, or the pulses of light from an extragalactic quasar, so long as you use the same units for whichever bodies you are comparing. The result is a ratio, and that will be the same no matter what your yardstick is. So here is the mystery; all of the rotation rates of the planet pairs in the solar system listed below the break are in ratios where the numbers on each side of the ratio add to a number in the Fibonacci sequence. Clearly, it is possible to get more accurate ratios by going to much higher numbers, but given that the ratios we have determined are all well within 1% of true values, and many within 0.1%, we didn’t see the need. This is such a remarkable result that it really ought to be a wake up call to astrophysicists to start taking an interest in their local solar system, in addition to hunting for exoplanets and galaxies. Since we have found many other phi and Fibonacci relationships in planetary data orbital elements and synodic periods too, the obvious implication of our result is that there is some kind of link between rates of axial rotation and orbital periods. We aim to discover what it is, how it comes about, and ultimately answer the question; Why Phi? Here are the primary pairs of neighbouring planets. Both Venus and Mercury have very slow rotations, because they are in some way tidally locked. Mercury is in a 2 orbits to 3 axial rotations relationship with the Sun. Venus is in a 3:2 relationship with Earth’s orbital period. Earth and Mars have very similar rotation periods. Jupiter and Saturn’s are comparable too, as are Uranus and Neptune’s. What isn’t expected is that the two gas giant pairs have the same ratios; 46:43. 2 Saturn 640 mins. (N1) 43 27520 m 89 (variable) N1) Sat. rotation varies: est. 636-648 mins. Next we have the ‘secondary pairs’ of adjacent planets. Our scheme of adding the ratio numbers to obtain a Fibonacci number doesn’t hold between Earth and Venus for their rotation periods, but as noted earlier, Venus rotation is in a 3:2 with Earth’s orbital period. Uranus and Saturn’s rotations are also in a 3:2 ratio. Finally, here are some more distant neighbour ratios for general interest. We haven’t checked every possible non-neighbour pair but found many which still fit the pattern of having ratio numbers which sum to a number in the Fibonacci sequence. The question is: Why? 1 Saturn 10.666 hours(N7) 21 223.986 h 21 + 13 = Upto 100 N7) 10.666 h = 640 mins. As we have noted in previous Why Phi? posts, the Fibonacci series has a curious way of re-appearing in ‘side shoots’ of whatever Fibonacci sequence containing data you are manipulating. Almost no matter what transformation you apply, the series will pop up again in some kind of residual, or error margin. Maybe this is what we are seeing here. Whatever the forces involved are, they are strong enough to keep the planets spinning round at rates which relate to each other, despite all the collisions and reconfigurations the solar system has been through since it formed. This leads us to believe that there is an ongoing process here, rather than a fossil remnant of an ancient epoch. One clue may be in Venus’ special situation. The body of the planet rotates at a slow rate, retrograde to nearly all the others in the solar system (Uranus has its own peculiarities). But the atmosphere rotates prograde, at a much higher rate. Naturally enough, that rotation rate is in a ratio with the rotation rate of its near neighbour, Earth, and of course, the numbers in the ratio 1:4 add to the Fibonacci number 5. For a whole-number ratio you need to find an elapsed time at which both planets have completed a whole number of rotations. It’s never exact, so the elapsed times are slightly different for each planet in that pair. The ‘% match’ column indicates the error. Not a lot in these cases. Naturally, the elapsed times are radically different for other pairs. Thanks for your enquiry, it offers an opportunity for providing clarity which will help us improve presentation. It’s also given me an idea for how to investigate the possible linkage between other parameters and rotation rate. TB: OK, now I understand what you’ve done. If all the stats look intimidating, just refer to the first group (‘primary pairs’). That’s the heart of the matter. ‘Primary pairs’ is our arbitrary classification. We might have reasons for making it, but the solar system doesn’t care. All the remaining adjacent pairs in the second table are equally valid and important in my view. I read a book on the Fibonacci sequence years ago, I cant remember the author, it was mentioned that the solar system also had Fibonacci component to it, to be honest I took it as a well known fact. Its funny how many people are sceptical of the Fibonacci sequence. I think it’s great to see work being done to show that the solar system does in-fact show to have a component of the Fibonacci sequence. It is known to exist in nature so why not the solar system. I’m a bit surprised that this is under-appreciated. Sparks: I’ve come across several references, but to the best of my knowledge, all attempts to integrate the entire system foundered in the inner solar system before getting out to the gas giants. That’s because they were using orbital distance as a basis for investigation, and working from the Sun outwards. I cracked the problem back in February by approaching from the outside inwards, and looking at orbits and synods rather than distances. Does this work for moons orbiting planets which may, in some sense, be regarded as mini-solar systems ? Rog, that’s how I generally work with planetary orbits and distances ‘from the outside in’, introducing orbits and synods for your investigation was a clever idea IMHO. At the moment I personally cant see anything wrong and the ‘% match’ you have found is very high which is a very good result. So its a ‘well done! from me. TB: With rotational periods of 58.65 and 243.02 days, and if I haven’t screwed the calculations up, Mercury and Venus point in the same direction (although not necessarily the direction they pointed in to start with) about once every 47 days. Now 47 isn’t a Fibonacci number, but it is a Lucas number. Might try some more examples when I get back from dinner. AiP: You’ve answered your own question. Because all the Moons are in a tidal 1:1 lock with Jupiter, their rotation periods are their orbital periods too. We have investigated them and will be doing a future WhyPhi? post on the Glailean system, which has some interesting relationships hidden within its orbital elements. The figure work for the Jovian moons has already been done and a post is pending in the near future, subject to TB’s decision. With a true moon (not a deformed rock) the rotation period is always 1:1 with its orbit period so there’s nothing to investigate on that point, but there are other properties worth looking at. Roger A: Please do, the more investigators we have on this the better. The maths isn’t that hard, just time consuming when investigating permutations. The main risk with any calc involving Venus is forgetting it spins the other way from the rest of the planets, so you need to use negative numbers and twist your head round. See the Venus rotation thread for Ian Wilson’s worked example. I think the Gas Giants must be a good starting point too. There must be some relation between rotation, diameter, orbital distance and velocity, and density, involving the falloff in gravity with distance from the Sun. Come on puzzle solvers, let’s do science! Said you hadn’t checked them all out, well here’s a peek. Being a programmer I love combos. You are right TB, Fibonacci numbers everywhere. Heh? If you notice there are even better fits the further you go back into the past and the larger Fibonacci numbers. I stopped the sequence when either the match was 100% or 10k revs of the longer period was reached. Only each better match is listed otherwise this list is very, very long. Don’t know, are you sure this is not merely a mathematical ‘of course’? Like a match is bound to happen at some combination and this might even work for other sequences, triangular numbers (Pascal triangle) or even random periods. Once again, I think you need to check that out very carefully to not fall into a simple but hidden numeric trap as I explained happened to me years ago. I learned my lesson. By adding the two numbers to reach a fib match you greatly widen the possibility of matches for each one, there are many possible sums adding to match each Fibonacci number. It’s not that I do not see that they do exist, they do, I just can’t fathom a physical reason (ie: physics) why they must. If you alter either one of a pair of body’s periods it will change the deviance to change but before it gets more than a small percentage away another pair of sums take it’s place. I don’t have time right now to delve deep into this analysis but the program that produces this is an email away. Maybe you have some time to check that out. Before you calculate any more planetary ratios I think you need to sit back and look at some fundamentals. I also suggest that you do this in a new post(s) rather than in comments to this post because the question is important, but up to you. I agree wholeheartedly. Bring on the mathematicians. 0, 1 ,1, 2, 3, 5, 8, 13, 21, 34 etc. The ratio of adjacent values converges on 1.618034, the “golden ratio” and ln(x) plots as a straight line. 0, 2, 2, 4, 6, 10, 16, 26, 42 etc. ln(x) again plots as a straight line. The sequence converges on 1.839287 rather than 1.618034, but so what? 1, 2, 3, 4, 7, 11, 18, 29, 47, 76 etc. Alternative 4; Use the Lucas numbers, which use 2, 1 seeds in place of the 1, 2 seeds used in Fibonacci. The resulting sequence is identical to the one above except that the first two numbers are flipped. 2, 1, 3, 4, 7, 11, 18, 29, 47, 76 etc. Wayne and Roger A: Excellent, this is what we needed; people able to bring a fresh point of view to the job, along with skills which speed things up. I said in email to Oldbrew that we really need to generate a set of random numbers and see how many matches we get, as a way of testing probability. having devoted a fair bit of time to hand-calculating our ratio’s with the real rotation data we hadn’t yet ‘got around to it’. Wayne’s nifty little program means we’ll be able to test some sets of pseudo-rotations. I’ll have more to say in response to your excellent comments when I’ve had my first cuppa and woken up a bit. Thanks for the time and trouble you’ve taken to investigate so far. Thank you Roger. I just learned something new it seems, never realized that you could just change the seed numbers and still pop out with the Phi ratio, now that is strange and adds a new layer to my gray matter on the subject. Rog, not trying to slam on the brakes, for there could really be something behind your thoughts on these patterns with Phi. As I mentioned in my very first comment on this subject I too have seen some very curious relationships with powers of Phi, like cubed, to the 3/2 power, 4/3 power and their roots of each along the sequence, etc but I never found much relation with the series numbers 1,1,2,3,5,8,13… themselves. I was speaking more on the line as Roger Andrews raised, 1, 1.618, 2.618, 4.236, 6.854, 11.090, 17.944, 29.034 those exact numbers and the sub-powers and roots between each. Just thought you might first question the pure numeric aspect of the ratios and I can’t help much there, I’m no abstract mathematician though I have always dealt in numbers every single day. Also I made a statements as if it was probably fact, that the deviances when rotations change roll over to new relations to Phi and that was not proper, that was merely a gut feeling and needs to be checked and ruled out. Maybe they don’t. Look at Venus, it doesn’t match most of the other planets (up to 10,000 rotations anyway). Maybe random sequences don’t line up to 99.9xx% matches and that would put your idea on a firmer footing. Rog, noticed you posted as I wrote, my post says 8:06 am, get your cuppa, my clock says 2:06 am and I’ll get some sleepa. I’m not sure that finding a Fibonacci match on another scale detracts from the idea that it’s a Fibonacci match, but let the debate continue. With Jupiter-Uranus (13/8) and Saturn-Neptune (21/13) see notes N6 and N8: they are both in a Fibonacci ratio to each other. That ratio can’t be altered by invoking a different numbering system. Wayne’s program output is very interesting. Notice there are only two matches for Venus. This makes me think a set of random pseudo-rotations is going to show we really have found something unusual. Wayne’s email hasn’t made it to either of the email addys he has for me, so I’ll have to be patient. Not easy! In the meantime, a couple of observations on his program output. These are all excellent matches, and 6765 is the Fibonacci number I found best fitted the whole system all at the same scale in my original post back in February. I’d like to know what value Wayne picked for Saturn’s variable rotation. It looks like 640 mins. We only found one 55 in our trawl through, good to see some more. Notice that 1562 is twice 781. 3606/1562=3.528. 1562/1022=1.528. This is very interesting. 0.528 is a gravity linked number. I’m trying to remember the calc I did, but it may be the ratio of the drop in gravity between the Sun and two planets in a phi ratio for orbit period, or distance – I need to check which. Just noticed: it should be the other way round. U+N = 2001 minutes, J+S = 1236-ish (if S is 640-ish). If Saturn is around 641.2, which is in between the Voyager and Cassini readings, you get phi. And Fibonacci: 377 + 233 = 610. This is a risky law over a restricted range since it is very close to a power law. Kepler was into this stuff, one of many circulating around a glowing matter. Perhaps some thought could be given to the kind of similarity in atomic structure, where there is conditional stability. One is energy levels. Another more interesting one is radioactive. My point here is that unstable N-body (which cannot be proven) might eject an object. Things bump along perturbing neighbours, get too much, something happens. It is also this which tends to cause ratio locking. Be a good idea to look at fractals too, which is back to fractional states as max entropy. I am pleased that you are finding some of the harmonies controlling our solar system for they will prove to be the same in all solar systems. The harmonics controlling galaxies and the entire universe may prove also to be similar. You do realise I see that you are seeing the end result of something greater that causes the harmonics, the fatal attractor. The common thread that binds all this together maybe the sacred geometry handed down to us from the distant past and epitomised in Da Vincis man in a triangle in a circle, which is really a pyramid in a sphere. The base of the pyramid touches the sphere at 19.5 latitude. Oddly at 19.5 latitude are permanent spots on the gas giants, this geometry fully blown in our first known civilizations came from some where. The harmonic magic number in all this is e/pi. Just my tuppence worth from an idiot brain that tends to correlate unrelated things over large time spans. What makes Graham Hancock think his ‘designer’ works in kilometres? This kind of nonsense is why people write off these kind of studies as ‘numerology’. And yes, I know the kilometre is supposed to be a unit related to Earth’s circumference. I’m still not buying it though. It may yet turn out to be the case that Earth’s diameter (and hence circumference) really is related to the (current) eccentricity of its orbit. Claiming that it is because an arbitrary unit of measurement happens to round to a number with a lot of noughts on the end of it for a particular measurement is not a sound basis to proceed on however. Good spot OB. Factorisation routine needed in Waynes program. I’m going to write a post to make my position clear regarding mystical and religious ideas about the golden ratio. Just to be clear on this thread, my position is that I make the assumption (and recognise that is what it is) that we will find a satisfactory scientific explanation for the manifestation of phi and Fibonacci related numerics in the solar system’s orbital elements and physical properties. In other words we are proceeding on the basis they are the natural outcome of scientifically demonstrated principles such as entropy, gravitation, quantisation and electrodynamics. Others are entitled to their viewpoints and they will be respected. However, only open minded comment which potentially adds to discovery and elucidation based on scientific principles will be published here. Dogma and unsupported mystical ideas can be taken to any of the many forums on the net which cater for them. This does not preclude informative material such as was provided on an earlier Why Phi? thread regarding the geographical siting of ancient temples and astronomically related constructions which help us understand paleoastronomy and ‘sacred geometry’. I would be grateful if unsupported editorialising about their function and significance could be kept to a bare minimum however. Oldbrew and I are restricting ourselves to laying out observations and logical deductions with the minimum of embellishment for now, because we don’t want to risk pre-judging the issue or pushing the discovery process in a particular direction. Mystery image is probably about EM force. Hush Tim, don’t scare the natives. Seriously though. I’m interested in any gravity only explanations for Venus spinning one way while it’s atmosphere spins the other people care to offer. Seems like an sort of a fabric . . It seems ..There is an importance to adding these variables to get Fibonnaci numbers. So can you map these numbers on to a pascal triangle and create a fabric? Have a look at this pairs position on the pascal triangle.. Awesome!! Why PHI?. THe answer is . PHI is a structural component of the solar system fabric..
A physics law/constant like any other Physics law.. These are interesting – almost 100% accuracy, with Earth at 365 in the Uranus ratio. Also 610 x 3/5 = 366, close to Earth days (= rotations) per year. More can be said about 610 but probably not on this thread. The table could be updated for values up to 610 if the match is better than the ones we found. As an initial attempt, we didn’t look at ratios beyond 233 as we already had pretty good results. Fibonnacci row 34 plus Fibonacci row 55 = Fibonacci row 89.. Thanks Weathercycles, interesting stuff with the Pascal’s Triangle. Tim C: Little while ago I mentioned maximum entropy, related to non-Gaussian, where this is indistinguishable in small sets. If there is a general decay to the same law the solar system might be too small to see deviation. I read the max entropy paper, and found it a bit hazy where it mattered. Lance has put an interesting snippet on the suggestions page, I’ve tracked the paper down and will upload and link it. The ratio of their densities is 0.52. The ratio of their distances from the Sun is 0.535. Pick the bones out of that one. The Fibonacci numbers are ‘built-in’ to the synodics e.g. 233 Jupiter-Saturn = 27 Uranus-Neptune = 34 x 3 Saturn-Uranus (that’s the ‘Grand Synod’ of 4627 years). We’ve listed some of this in Why Phi part 1 but there’s more to come. Oops, probably should have said ‘ diff <' instead of ' diff <=', so all of the exact multiples will also appear in the printout the way it stands. Rog, you should have received that shell of a program by now, let me know it got there. As I noted earlier, all numerical sequences constructed by summing the previous two numbers will give ratios that converge on 1.618034. It doesn’t matter what the two seed numbers are – one, 0.000001, Avogadro’s number, the cube root of Pi – you can enter any of them in any order you like and they will still converge on Phi. So which sequence do you choose to compare your observations against? 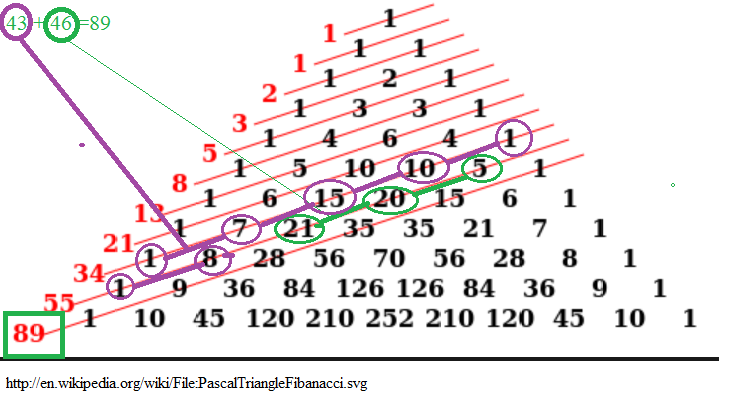 Fibonacci, Lucas or one of the other infinite number of numeric series that converge on Phi? At our current state of knowledge you’re basically tossing a coin. And what do you conclude when you find that all of your observations fit Fibonacci but none fit Lucas? Well, you could conclude that Fibonacci must be right and Lucas wrong, but that’s an exercise in circular logic. Alternatively you could conclude that there’s something in the mathematics that generates a near-perfect correlation with Fibonacci but zero correlation with Lucas, which brings us back to the concern Wayne expressed in his earlier comment. So what to do? Probably the best solution would be to forget about numerical sequences altogether until someone can demonstrate which, if any of them is the “right” one to use in your study. The “Vegetables and Fruit” section shows two cauliflowers, the first with 5 spirals in one direction and 8 in the other and the second with 13 in one direction and 21 in the other – all Fibonacci numbers. But the “Always Fibonacci?” section lower down shows a succulent with 4 spirals in one direction and 7 in the other, another with 11 in one direction and 18 in the other and a cactus with 29 ribs. As the article notes, these aren’t Fibonacci numbers, they’re Lucas numbers. But in each of the five examples the ratio of the number of spirals is as close as we can get to Phi, bearing in mind that decimal spirals don’t exist in nature. Well said TB. There is a science reason if there is anything there at all, or maybe it’s mathematic. Read up last night about spin-orbit coupling, resonances, harmonics, periodicities, for these are in an area of science I have tended to ignore all of these years. Never dived into those details. One curious statements stood out for me. Wiki says Pluto and Neptune are in a 3:2 locked ratio and that is key to me. If ‘science’ in general accepts that those two far removed planets can have enough tidal forces between those two over the life of our solar system then all of the further inward planets also have the time (billions of years) and gravitational interaction to form tidal harmonics (due to the eccentricies) and I never realized ‘science’ accepted that viewpoint. That drags this topic out of the mystic, weird, area concerning special numbers such as Phi. Now I can more comfortably engage what is being tossed about here. No Mail from you yet Wayne. Try a hello with no attachment to my personal address please. Or did you send the program to work? It was Oldbrew who found a doubled up ratio. The one I found had the doubled value in the numerator in one ratio and the denominator in the other. Wayne: Now I can more comfortably engage what is being tossed about here. Well that is GREAT news. We need your skills to crack this problem. While I wait for you to get a copy of the program to me, please would you create a set of pseudo rotation periods by adding or subracting a smallish random number from the real rotation periods and see how many matches are generated compared to the real ratios. Thanks. Roger A: And what do you conclude when you find that all of your observations fit Fibonacci but none fit Lucas? Well, you could conclude that Fibonacci must be right and Lucas wrong, but that’s an exercise in circular logic. How so? I originally discovered that the Fibonacci series fit the orbits and synods by direct observation. No logic required. Wayne, got it now, many thanks. I’ll need your help to drive it. Let me set the record straight on the circular logic issue. Second, I wasn’t accusing you or anyone else of circular logic. My point was simply that ONE can’t claim that your solar system results prove that the Fibonacci numbers are right and the Lucas numbers wrong without reasoning in a circle. (I theorize that the solar system is controlled by numbers. I find that the Fibonacci numbers match this theory but the Lucas numbers don’t. Therefore the Fibonacci numbers must be right and the Lucas numbers wrong. Shades of Trenberth). And the issue is moot anyway because as far as I know you have never made this claim. Roger A: No problem, I didn’t take any offence in what you wrote, just didn’t understand what you meant by ‘circular logic’ in this case. Fibonacci fits the orbits and synods. It also fits the rotations. Fibonacci is stated by one author Tim C linked to be linked to entropy and the log-normal distribution found in nature. Phi contains within itself the inverse square. I just found an apparent relation between Phi, density, distance, orbital periods, rotation and diameter which has been totally ignored since I posted it at 5:43pm today. Our posts contain a question mark. We don’t know how the ‘phi effect’ operates, or even if it is anything real yet. But there sure is an awful lot of coincidences going on if the relations we’ve found are by chance. We don’t claim Phi and Fibonacci rule the cosmos. Gravity, electrodynamics, entropy and quantisation rule the cosmos. We want to find out why the interaction of quantisation, gravity, electrodynamics and entropy happens to express the Fibonacci series and phi. And it isn’t just phi, the lower fractions in the Fibonacci series differ from Phi by appreciable margins, and Oldbrew has identified an 8/5 relation between the Jovians and the inner solar system, and an 8/13 relation between the Jovians and the outer dwarf planets. We’ll prove that in Why Phi? part 3. There’s only so much my poor beleaguered braincell can hold at once. Please try to fit the Lucas series or whichever other number series you fancy your chances with to the data and see what you get. My brain will explode if I try to start investigating two systems at once. Hi Carol, our ‘Why Phi’ question isn’t teliological. We are not implying there must be ‘designed order’ in the system. We are asking why the order which naturally arises from the interaction of forces and the temporal evolution of the universe expresses the Fibonacci series and Phi in the phenomena we observe. The reason we’re asking that is we hope the answer will give us insight into the reason for the strong correlations we observe between the timings of cyclic events in the planetary motions, and cyclic events observed in solar variability and Earth climate responses. A brief comment for anyone who didn’t read as far as the ‘non-neighbours’ section of our data, or might have overlooked some of its contents. These ratios are independent of any ideas on how the rotation system might work, being a simple division of one rotation period by another. It just so happens they are Fibonacci ratios. Again, that’s a ratio so unaffected by anyone’s ideas. I’d suppose that the minimum energy exchange between two orbiting bodies would be obtained in a full tidal lock, something like the Moon and Earth. That’s probably the “tendency” of all bodies in stellar system — but there would be partial minima, so to speak, at any resonant ratio. The F.-series must then consist of a sequence of such local minima, such that deviation from one, once in place, requires some external impulse. N-body interactions supply such externals, but with their own resonances. Only very occasionally would one be enough to push any other orbit out of its “valley” and send it downslope to the next one. You put it better than I could. The tidal locking is a key factor here I believe. We wouldn’t expect to see 1 to 1 in the planets themselves as you say, so something else has to happen instead, which we attempt to describe here. OB: Yes, and along with those accurate low number ratios we can mention the 13/8 between Earth and Venus Orbital periods producing 5 synodic conjunctions while Venus spins 3 times per two earth orbits. To that we can add that during this 8 year E-V conjunction cycle, Mercury passes by venus 21 times as it completes 34 orbits of the Sun, also spinning in a 3:2 with its orbit. Meantime Jupiter will complete 2/3 of an orbit. Our data shows a pattern lasting over 100 million years – could be a big triangle!!! The triangle for planetary rotation should not be a big triangle. The largest sum of planet couplet rotations is 233. from your data table. The same arrangement as they are Fibonacci numbers. What 2? forces have values of 1 and 7 to make pluto rotate 8 times? or is that what 2 bodies rotate 1/8th pluto and 7/8ths pluto? Not sure here.. What those numbers in the triangle series represent? I look forward to seeing the data for the moons or any other connections? Why did you use different units to calculate rotation eg day/ hr/ month? Readability mostly. We’re only looking at ratios and the units don’t affect that. Venus = 349948.8 minutes isn’t user-friendly. Neither is 0.4135416 days for Jupiter. Pluto and its ‘moon’ Charon rotate 1:1 – some say it’s a binary planet system as Charon is half the size of Pluto so ‘too big’ to be its moon, perhaps. Results as promised. What I’ve been doing is somewhat laborious and I’ve only applied it to two cases. You might try applying it to a few more – so long as I haven’t reinvented the wheel, which I don’t think I have. And here are the results for Mercury/Venus, plotted up. Of the 28 numbers on the table (I added the difference between the number of rotations as well as the sum – well, why not?) two are Lucas numbers (orange) and two are Fibonacci numbers (yellow, one of them the 144 listed in your table). Incidentally, if you don’t hear from me for a while it’s probably because the power is out. Tropical storm Manuel is heading this way. The 29:7 ratio is as you note composed of two Lucas numbers. We multiplied it up by four to get our Fibonacci sum, which is a bit of a cheat we didn’t have to use in other cases. Their sum is 36 which is 2 more than Fibonacci number 34 and their difference is 22 which is 1 more than Fibonacci number 21. The nearest Lucas numbers are 18 and 29, 4 and 7 away. 1 and 2 are shared by both series and 4 and 7 are of course also Lucas numbers. So it’s a good tussle to decide which is better. The decider for me is when we look at orbital periods and synods too. Clearly Lucas numbers are of interest too, but they would give us too many variables if we were to throw them around willy nilly. I’ll keep them in mind though, so thanks again for your investigation. If you’re minded to play with more rotations or orbits using the Lucas numbers and find out anything noteworthy, let us know. I expect most people here have seen the video on youtube of the 5 metronomes on a plank on two coke cans become synchronised after a couple of minutes. Here we see 32 of the little clacky blighters do the same trick in 4 rows of 8. Very instructive watching the rippling along and across the rows as they sort themselves out. Makes me wonder what three of them in 1-phi-phi^2 frequency ratios would get up to. I might try to find a loan of a few mechanical metronomes to try it out. To clear up an apparent misunderstanding, I’m not trying to fit the solar system to Phi, Fibonacci, Lucas or any other numerical sequence. I’m just going through the data the way I would if it was, say, a geology data base, trying to find what correlates with what and what doesn’t. When I’ve finished I may get on to thinking about what the correlations or lack thereof might tell us about causative mechanisms, but that’s more up your street than mine. I do have one question, though. We all know that Lucas flipped the first two Fibonacci numbers, but I can’t find out what his rationale for doing this was. Do you know? I think it was more that he found the Lucas series popping out of his Fibonacci investigations and backtracked it to its origin point. Of course that ‘adjustment factor’ will be the same for any 29:7 Mercury:Venus period. This may be telling us there is more to these rotation periods than we have so far detected. Nah. You don’t make wild-assed guesses. You make SCIENTIFIC wild-assed guesses. There’s a big difference. 5866/(116-28)=66.66 if that’s any help… it’s in a 2:3 with 100… wibble. That’s where the adjustment comes from, in 1862.9869 years. Blink and you miss it. 116 days (which is pretty near 2 Mercury rotations) in 1863 years. So in around half that period at 932 years, Mercury slide ahead by a full rotation? The tables in the link below list Mercury/Venus rotational conjunctions out to an elapsed time of 7,000 days. The first table lists the 12 conjunctions above the 96% match threshold. The second lists the four more robust conjunctions above the 99% match threshold that define the dominant ~1,700 day M/V cycle. At first glance it seems that neither Fibonacci nor Lucas do too well. But three out of eight direct hits in the second table ain’t bad and some of the misses can be classified as near misses. The match certainly seems better than random. The last column on the table shows the cube root of the ratios of the M/V rotations. Why the cube root? Because that’s how you calculate Phi if the rotation numbers are three Fibonacci or Lucas sequence numbers apart (7 and 29 are three numbers apart in the Lucas sequence and 21 and 87 are very close to 21 and 89, which are three numbers apart in the Fibonacci sequence). So if we can come up with a reason why M/V rotational periods should be three sequence numbers apart we will have a direct connection between the behavior of the Mercury/Venus pair and Phi. That’s the good news. The bad news is that this doesn’t seem to work for the other planetary pairs, but it’s early days yet. Have you questioned if that is compensated (or partially) by the precession of one orbit’s primary axis in relation to the other’s? All of this so far seems to assume alignment to the stars (or solar??) by the period of the slower. Or am I not looking at this correct? No. On the 28:116 scale, Mercury is ‘losing’ one day to Venus for every 100 of its own rotations. Moving swiftly along, the most accurate ratio for Earth:Mars is 672:655, or so I thought. 24 x 672/655 = 24.6229 which is the ‘sidereal rotation period’ on the NASA fact sheet. Then they put a spanner in the works: their corresponding Earth s.r.p. is 23.9345! 621 itself is 23 x 3³, also midway between 618 and 625. Do we have a common factor of 621 here? Why is the 99Me = 24Ve 99.55% missing from your table? Adds to a Lucas number too. Oldbrew and I have noticed a number of ‘powers of phi’ popping up too in our investigations. We haven’t divined any pattern to them yet, but it’s definitley worth working on, as the ratios between the gas giant pair diameters and rotations show phi^2 and phi. I also found a phi^3 after some juggling yesterday. I note that at 8 and 13 Ve rotations we get 33 and 54 Merc, which are both ‘one away’ from Fib numbers 34 and 55. Thinking about Mercury’s physical situation on a highly elliptical orbit near the Sun, we should, as Wayne points out ask the question; why the high ellipticality? The orbit only precesses slowly; the famous 43 arcseconds per century problem Einstein botched so badly ( 🙂 ) tells us the orbit precesses very slowly; 5603.24 arcseconds per century total (excluding apparent motion due to Earth equinoctal precession (5028.83 arcseconds/cy), which may tell us how fast the solar system as a whole is rotating if Alsor is correct). 1 arcsecond is 0.000277777778 degrees so 5603.24 is 1.55645555680072 degrees per century. That’s a full precession of the eccentricity of Mercury’s orbit every 23129.5 years. That’s not all that far from the estimated rate of Earth’s equinoctal precession around 25800 years. It’s also 10 times the average Halstatt cycle length. Perhaps that’s telling us something. Seems to me the eccentricity of Mercury’s orbit is something to do with keeping both its rotation rate and its orbital period in sync with other bodies. We’ve looked at both, and found phi. That doesn’t exclude other possibilities, but it’s not inconsistent with our hypothesis, so we can keep moving forward. I did some research on the subject and I’ve found something that may blow your socks off and is being over looked, as the calculations use a function of time, then; we are actually dealing with two separate time scales within the solar-system as a whole. The inner solar-system consisting of Mercury, Venus, Earth and Mars should be treated as a system of its own separate from the time-scale of the outer solar-system consisting of Saturn, Jupiter, Uranus and Neptune, this will give two separate components with two separate sets of Fibonacci numbers to work with. There is also a maximum and minimum distance from Mercury to Mars for working out an accurate scale with the inner-solar-system as the elliptical orbits change over time, the same also applies to the outer-solar-system. When you correctly treat the time-scales in this way the Golden Section very clearly shows up periodically as an ‘approximate Golden Spiral’, its even visible in orbital simulations. If you look at this snapshot above and the ratios of the inner-system from 7-9-2013 you can clearly see an ‘approximate Golden Spiral’, we can even casually simulate when the next approximate Golden Spiral will be or when they were in the past and take simulated measurements to look for ‘true Golden Spirals’, in fact, they can be verified by observations and measurements taken and tested by any independent astronomer/s. In the snapshot below of 19-5-2045, it shows another ‘approximate Golden Spiral’ in the outer-solar-system. As the outer-system has longer orbits the frequency of ‘approximate Golden Spirals’ showing up occur on longer timescales compared to the inner-system. (Note:The outer-system works better as an ‘approximate Golden Spiral’ if the focal point is the Sun and the inner-system). There are also regular perturbations over long time periods between Uranus and Neptune that change the orbital ellipse of these two planets, so each time these two planets meet; the ellipse of their orbits will change, this produces a randomness over huge timescales. An interesting feature of this randomness is that no-matter how much their elliptical orbits change, it does seem that the outer-system wants to rest at an equilibrium as a Golden Spiral and as a result it may take hundreds of years for an ‘approximate Golden Spiral’ to form and thousands maybe tens of thousands of years for a ‘true Golden Spiral’ to form. Also… I think you get a golden ratio between the inner-system and the outer-system. I’m doing a bit of work on that. It involves working out the minimum and maximum distance of the inner-systems planetary orbits and comparing that ratio with the outer-system. i.e comparing a square around the inner-systems maximum orbital value with a square around the outer systems maximum orbital value. Hi Sparks. There’s a ready made approximate golden spiral emanating from the Sun called the Parker Spiral. It is the trace left in the differentiated solar wind of its outward movement as the Sun rotates. Regarding your idea that outer and inner solar system should be treated separately: Oldbrew has found that the relationship of the Jovians to the inner system is 8:5 and the Jovians to the Transneptunian dwarf planets is 8:13. Fibonacci strikes again. We’ll cover this in Why Phi? part 3. Rog, there’s another point I’ve been trying to explain to you for a long time which ties into why the outer and inner solar systems should be treated separately in your Phi idea, if you look at the timing and shape of the inner-system, it will look like the planetary index you have graphed above, the timing will be almost there but the shape of the intensity will be at a constant height, but if you use the outer-system for the shape of the intensity (the height) and use the inner-system to correct the timing you will have a correct match. One other thing I forgot to mention was that the ‘approximate Golden Spirals’ I’ve shown above occur in pairs in the simulation, they’re like buses, none come for ages then two come at once. How long between pairs of ‘approximate Golden Spirals’ for inner and outer system? How long between the ‘approximate Golden Spirals’ of the pair for inner and outer system? Even a rough estimate would be better than nothing. And you know this because you’ve done some calcs? Or because you intuit that the gas giants control the amplitude of the solar cycle? Or what? Which I guess brings up the question, when is a conjunction not a conjunction? RA: Conjunctions is best reserved for orbital synods, or we’ll find ourselves at cross purposes. So what shall we use for the coincidence of axial angular orientation? Re-synchronisation is the best I can think of just now. I’ll check the calcs again for the 99Me 24Ve thing. I’m sure you’re right though. Until I get the dates and some figures for you Rog, the ‘approximate Golden Spirals’ occur in the outer-system before and after Uranus and Neptune pass each other, they are also mirror images of each other. In the inner-system the ‘approximate Golden Spirals’ are more chaotic this is due to mars, its orbital eccentricity is off, likely caused by Jupiter. These ‘approximate Golden Spirals’ appear and disappear by themselves (singularly). If mars had a more circular orbit they would happen frequently and often and also mirror each other. I can map the actual timing out when they occur for both systems. I know this because I have done lots of work manually mapping out the orbits and looking at the data for both of the systems I’ve mentioned above and treated them separately, for example; If we took the planetary index data in your graph, the difference between the data of the outer-system and the planetary index data will improve the match to the intensity of the solar cycles. I’d like to see a graph of the planetary index without Jupiter, how well does the timing hold?. Sparks: The Jupiter-Earth Venus cycle which matches the timing and shape of the solar cycles doesn’t work without Jupiter. What I did find was that in order to get a good match I needed to dial down the Venus factor. Earth and Jupiter have strong magnetospheres, Venus desn’t, so this makes sense in the context of the alignment along the (electro-magnetic) Parker Spiral. Your comment about the outer planet spirals coming before and after U-N conjunction is interesting. Are they around 37 years apart? Rog, I will have to double check, But I think they are approximately 67 years apart. I just checked, it is highly variable. Likely to be a different mechanism to the J-E-V PArker spiral alignment too, since the Parker Spiral winds round tighter as the solar wind speed drops further out. So Jupiter can be involved in both inner and outer systems via different forces. Suggest you get your stuff ready for me posting Geoff Sharp’s paper in a couple of days. I’d like to take this thread back on topic to rotation. If they are 67 years apart it means they appear approximately 33.3 three years before the conjunction and approximately 33.3 after the conjunction. The conjunction happens every 170-172 years. Dunno about resynchronization, TB. It implies that the two planets used to rotate in synch, went out of synch and have now come back into synch. How about “rotational realignment”, or maybe just “realignment”? Columns 3 and 4 are the number of rotations completed by Mercury (column 1 divided by column 2) and Venus (column 1 divided by column 3) since day 0. Incidentally, Tropical Storm Manuel turned left and missed us. I think your column 8 method is where it goes wrong. By summing absolute values if both planets are the same distance from complete revs but on opposite sides, your method would show a match where none existed wouldn’t it? If that period came down 7 years it would be 1440 x 100 Mercury rotations = 23122.4 years. Still a 99.97% match though, as it is. Er, no. Absolute values convert all the negative numbers to positive numbers, thereby putting both planets on the same side. For example, if Mercury is fourth-tenths ahead of a complete rev and Venus four-tenths behind they will give +0.4 and +0.4, not +0.4 and – 0.4. But in the 26 day difference, Mercury will turn nearly halfway round. Or Venus will have turned about 33 degrees. So depending how you’ve worked out the error, that might account for the difference in percentage error we’re getting. [Edit] Yep, that the reason for the difference. You are working out how far from complete rotations they are at the re-alignment intervals, whereas we’ve been working out the overall error over the entire period. I think that to be more rigorous, we need to calculate the orientation of the spinning planets to each other as well. We might find something interesting out. I have to concentrate on speech writing and two journal submissions over the next week though, so it’ll have to wait. You know Sparks, I did come across that same curiousity when I started looking into this. Darn, erased that spreadsheet !! Phi relations when plotted in a certain manner for the planets, Me, Ve, Ea, Ma all fall on basically a stright line. Also Ma, Ju, Sa, Ur, Ne also fall on a straight line but the slopes of the two lines are different leading me to believe that is the same effect you are speaking of. Notice the two lines intersect right at Mars. Think you are onto something there. I’ll try to recreate the equations that show that. First let me say that I’m grateful for your comments on all this. They’re making me think about what I’ve done (OK so far) and also providing valuable insights on what you’ve done. Which brings me to my second point. The important number in your calculation isn’t the 5806.35 days or the 5832.48 days. It’s the 26.13 days’ difference between them. This difference tells us that Mercury points in the direction it started out pointing in 23.16 days before Venus does, and with Mercury completing a rotation every 58.65 days this represents a LARGE angular discordance (I make it 39 degrees, but don’t hold me to that). This is why my percent match estimate is only 0.8925 (and now I’m surprised it’s that high – must go back and check). So how do you get your 0.9955 estimate? By dividing by elapsed time. But you can’t do that. The angular discordance is independent of time. If it had happened at day 100 your calculation would have given you a match of only 0.7387, and if it had happened at day 10 only 0.5545. And if it had happened at day one million you would have achieved a match of 0.99998. The Fibonacci sequence rapidly approximates the golden proportion. The golden proportion is the number which is most difficult to approximate accurately by a fraction, for all sizes of denominator. This is very important because if a number can be accurately represented by a ratio with small denominator then there is a resonance. The discovery here is just another way of saying that planetary rotations avoid accurate resonances. So you’re right, and this is why high ratios give high percentages. We need to model not only the rotation as seen against the fixed stars background, but also considering the planets orbital orientation to each other, as Ian Wilson did in the worked example for Earth-Venus I pointed you to. That’s where the matter of Venus’ retrograde spin is important. Thanks for picking up on this, its why I like doing our investigation in real time. Smart people like yourself who are willing to get the calculator out pick up on errors and improve our chances of getting it right. Hi Ray: It’s a bit more subtle than that, because Earth and Venus are close to phi for orbits and synods, and although they’re not for rotations, Venus ends up presenting the same face to Earth at each synodic conjunction due to their relative motion. Having trouble resolving the 233 rotation sums. Not sure why. If you draw this you have a sort of a family tree structure. I forget the mathematical name? The mid point is Jupiter Saturn pair? sorryl ran out of time to draw this on paint. I will do2morrow night if it explains better. BTW..Can you calculate sun/planet rotation sums? Why not pair planet and sun rotations? A graphical example of how my method works, for you to look at when you get tired of writing speeches. The first graph plots the angular divergence for Mercury over the first 1,000 days relative to the 0,0 start point. After the first half-rotation (29.325 days) Mercury is 180 degrees away from where it started. But when it passes 180 degrees it begins to move back closer to a complete revolution, reaching that point after a full 58.65 day cycle. Hence the sawtooth form. The second graph plots the same data for Venus (243.02 day period). The third graph shows the sum of the Mercury and Venus angular divergences, which I’m using as a measure of how far off an exact realignment the two planets are at any one time. In the first 1,000 days the closest we come to an exact realignment is a 12 degree divergence after 234.6 days (4 Mercury rotations/1 Venus rotation). Then we get 25 degrees after 469.2 days (8M/2V), 37 degrees after 703.8 days (12M/3V) and 37 degrees again after 997.05 days (17M/4V) . Do any of these qualify as “realignments”? I would say not. They’re too far off. Two of the 16 numbers are Lucas numbers and 2 are Fibonacci numbers, enough to suggest that something is going on but far from a perfect match. And unfortunately the other planet pairs don’t look as good, although I’m not through with them yet. Has anyone looked at axial tilt of the planets during conjunctions? for example; during each conjunction between Venus and Earth is it always winter on earths Northern hemisphere or is there a pattern of four Northern hemispherical winters and then four Southern hemispherical winters. Because we know it takes Uranus with its unusual axial tilt of 97.77 degrees two solar cycles for its poles to alternate. I’ll be looking into this tonight! In an anonymous footnote to his 1766 translation of Charles Bonnet’s Contemplation de la Nature, the astronomer Johann Daniel Titius of Wittenberg noted an apparent pattern in the layout of the planets. If one began a numerical sequence at 0, then included 3, 6, 12, 24, 48, etc., doubling each time, and added four to each number and divided by 10, this produced a remarkably close approximation to the radii of the orbits of the known planets as measured in astronomical units. This pattern, now known as the Titius–Bode law, predicted the semi-major axes of the six planets of the time (Mercury, Venus, Earth, Mars, Jupiter and Saturn) provided one allowed for a “gap” between the orbits of Mars and Jupiter. BTW….How do you account for the asteroid belt in your planetary models? Looks as though the asteroid belt needs to be incorporated? Can some one explain the Phi relationships here? some are 1 .1.618 and 2,618? The final ratio resolves to 2.618? You could argue here that the solar system is split into 3 sections with Jupiter Saturn couplet the divisor and inner and outer sections either side? The Bode Titius law got a big boost when Uranus was discovered and fit their equation. But Neptune didn’t work out so well, and Pluto is a long way off. The ‘Law’ is actually a heuristic fit, rather than based on any underlying physical principles. Can we reasonably expect to find a relationship between the Fibonacci sequence and the number of planetary rotations needed to achieve a rotational “realignment” when Fibonacci increases logarithmically and the number of planetary rotations increases arithmetically? Saturn 48 96 144 192 240 288 336 etc. Uranus 72 144 216 288 360 432 504 etc. 1, 2, 3, 5, 8, 13, 21, 34, 55, 89, 144, 233, 377, 610 etc. Clearly there’s no way we’re going to match Saturn/Uranus to Fibonacci. All we can expect to get is some serendipitous “hits”. The two Fibonacci number 144s in the Saturn/Uranus realignment series are examples. I haven’t yet worked out the internal relationships of that calculation, but it looks likely that all these parameters relate to each other. Obviously the orbital periods and distances relate via kepler’s third law, and that involves the square of the orbital period and the cube root of the distance. That might have something to do with the powers of phi we are seeing here. Likewise we still haven’t worked out why the sum of the two sides of the ratios of completed axial rotations (ignoring the residuals) add to a phi number. It just does. It may be that the number of rotation realignments you need to add before you get a ratio which adds to a phi number tells us something. So for example we had to go to 4 times the fundamental to get the Venus Mercury ratio which added to a Fibonacci number, from 7:29 to 28:116. The nearest whole number ratio for one Venus rotation is 4 Mercury rotations. 4×68.65=274.6 vs 243.013 for 1 Venus rotation. So let’s look at mutual realignment rather than re-alignment to the ‘fixed stars’. I think this is worthwhile because after all we are looking for mutual interactions between nearby planets, not so much interactions between planets and the far away galactic core. When we did this for Venus and Earth, we found that although their rotations wrt the fixed stars required us to go to high numbers to get a match, Venus presents the same face to Earth EVERY TIME THEY MEET. Mercury and Venus are in conjunction every 144.56544 days. Every 28 synodic conjunctions, Venus completes 18 orbits and Mercury completes 28+18=46 orbits. In this same period Mercury completes 69 axial rotations. So we know Mercury presents the same face to Venus every 28 synodic conjunctions. This just happens to be the length of the JEV cycle. It is also the same period of time as the average solar cycle length (11.08 yrs). Jackpot! We also know Mercury rotates three times on it’s own axis per two orbits of the Sun. Venus is more affected by Earth and Jupiter than tiny Mercury, so she cannot repay the compliment to Mercury on the same timescale. However every third time Mercury gives Venus the nod, Venus winks back at Mercury, having completed 50 rotations, equal to 3 solar cycle lengths or half the period of the Atlantic Multidecadal Oscillation (Weathercycles will like that one). Is all this just a coincidence? Not a chance. From what l gather. RA…The Fibonacci series and phi phenomena is found by pairing the planets from the sun outward..
You get 5 pairs and Saturn / Uranus is not one of them. They both belong in different pairs. The shape of the family tree structure is logarithmic? The shape is a triangle and the apex to base is logarithmic? Yes. That is promising.. The first 2 planets closest to the sun linked to the triplet solar cycle.! Need to explain the AMO phase change? I don’t think we’re going to reach common ground until we are all looking at the same data. Right now you gentlemen are basing your conclusions on a comparative handful of – I don’t want to say “cherry-picked”, so I’ll say “selected” – cases while I’m looking at literally tens of thousands of planetary rotation numbers which in some cases I’ve calculated to the nearest hundredth of an hour. So what I think I’m going to do is summarize my results in form that will fit in a comment so that you can see where I’m coming from. Maybe I’ll have it ready later today. Weathercycles: You can’t compare the JEV numbers this way because each of the numbers represents one half of a ratio which is not in the same time ratio to other pair ratios. Regarding the timing of mutual nods between Venus and Mercury: Although it’s clear that there is some kind of density distribution anomaly in these planets (possibly because Mercury fissioned from Venus originally according to Van Flandern’s theory), it’s not obvious from looking at them. So we would look at the orientation between Venus and Mercury at a Venus-Earth synodic conjunction to determine where the ‘heavier side’ of the Venus is. Then we can look at how the JEV configurations match the solar cycles and work out what Mercury is up to. How this ties into solar activity is a problem Ian Wilson is working on, although the timings are not in dispute. The solar sidereal equatorial rotation rate is 24.47 days. For a point on the solar equator directly under Mercury to come round and be directly under Mercury again takes 33.899 days (Because Mercury has in the meantime completed between a third and a half of an orbit, and the Sun has to ‘catch up’). This is close to half the Mercury rotation period, so we can say there is an approximate 2:1 relationship there. The Mercury-Venus synodic period of 144.565 days divided by this Sun-Mercury ‘synodic/rotation’ period of 33.899 days is 4.2646, which is 0.7% away from phi cubed. One beat period is 44.283 days, which is just over 1/2 of the Mercury orbital period, just under 1/5 of the Venus orbital period and just under 1/8 of the Earth’s orbital period. The other beat period (also equal to the Venus-Solar rotation ‘synodic period’) is 27.46 days which is 0.6 days short of 1/8 of the Venus orbital period, 0.3 days over 1/9 of the Venus rotation period, 1.86 days short of 1/3 of the Mercury orbital and also 1.86 days short of 1/2 of the Mercury rotation period. The ratio of the two beat periods is within 0.4% of phi. The 144.565 day Mercury-Venus synodic period is only 1.41 days short of being in a 4:1 ratio (4.039 = 1.5926^3) with the Earth-Venus synodic period of 583.92 days (1.5986 years). This is the area where we get into the way in which the planets just avoid being in destructive resonances, but also just nearly maintain their Fibonacci relationships. Well to be honest, I don’t think you’ll succeed in dragooning me into looking only at sidereal rotation periods, because I’m having way too much fun making rapid advances in solar system dynamics theory by looking at mutual rotation periods which also involve the synodic periods. I think we’re still in the exploratory observation stage and it would be a mistake to try to systematise too early. We’d miss more than half of what is going on. I’m certainly interested in seeing your results though, so it’s great to have more than one approach being pursued. So, why 32 and 9? Hmmmmm. Time for sleep. No actually mind bogglingly amazing!! Spent a little time looking …with not much success!!! Good work WeatherCycles. And I’ve discovered something else too. More when I get to a full keyboard. OK, here’s something else interesting about Mercury and Venus’ vital stats. At this stage, I’m just playing around with possibilities, but given the matches we found with the gas giants, experimenting with diameters and square roots seems a reasonable line of attack. Hey..TB thanks.. ! Glad l got a tick .. The ratios of pairs can be calculated in either direction ( see my direction arrows on image). Which is the correct direction. Does the sun have an orbital period around the barycentre? Weathercycles: Simple idea, interesting result. Good to have several brains working on this now. Another demonstration that rotation rates are intimately linked to orbital periods. The Sun’s ‘orbit’ round the barycentre is complex because the radius constantly varies and the period is variable. Geoff Sharp has looked into the barycentre periods in the X-Y plane more carefully than I have, and he can better answer this question. If Jupiter and Saturn were the only two big planets, it would be 19.859 years, but Uranus and Neptune change the situation considerably. Orbital distances: The log plot is substantially straight and follows Phi to within 5%. Note also that there’s a new planet on the graph – Ceres. I added it in because it’s the largest asteroid in the asteroid belt, because rotational and orbital data are available for it and because I get a kink in the plots if I leave it out. Hi Roger A: Nice work! Thanks for this. You got Ceres on the wrong side of Jupiter though, the Asteroid belt is between Jupiter and Mars. I can explain the orbital periods conundrum using Kepler’s 3rd law, which tells us that the square of the orbital period is equal to the cube of the distance. So if we take the phi relationship you’ve found in the distance and cube 1.618, and then find the square root of the result, we get 2.05818. Planetary rotation is getting more interesting by the hour. There are clear links with orbits, but not necessarily of the orbit of the planet doing the rotating. Notice the Gas Giants, and tiny Ceres, lie along a straight(ish) line. Notice also that if you plot the ‘primary planet pairs’ you’ll get a smoother curve, and not just because there’s half the number of datapoints. I think all this does is verify Kepler’s 3rd law, but I’m intrigued by the fact that planetary orbits and distances are linked both by power series and by log relationships that are only 5% off Phi. Has any work been done on this? Roger A: I’m intrigued by the fact that planetary orbits and distances are linked both by power series and by log relationships that are only 5% off Phi. Has any work been done on this? Here is an amusing (and perhaps deep) observation of the Fibonacci sequence entering in to the mathematically interesting (and perhaps practically important) question of how power laws and lognormal distributions come into being. with pseudorank k − 1, or a “b” to a word with pseudorank k − 2. As I’ve been saying for a while now, The inverse square law of gravity (power law) and Phi are linked by the inverse square hidden in the constitution of the number phi (infinite surd). And the Fibonacci series can be generated from phi via the quantisation of the golden mean forming a fractal, as well as the Fibonacci series converging on the golden mean. Google the Mitzenmacher paper, I have to dash. Thanks for the correction on that Matrix l constructed TB. Thanks for the interesting response TB.. The pairs could be ANY pair? Just continuing to be blown away by these findings. !! The other adjacent pairs are well worth investigating beyond the ‘primary pairs’ All the rotation comparisons for these two sets are in tables 1&2 of the headline post. Finding all the relations between pair rotation ratios and the orbital periods of dominant nearby planets is an important exercise. Plenty of permutations to go at, so discovery beckons. I’ll concentrate on the mutual alignments, though I’m as likely as anyone to foul the maths up. It’s not that difficult, but easy to get wrong. I would think with the results you are getting TB and oldbrew.. The results tonight had me bamboozled a little. I realised that the earth being of the value 1.. day rotation gave some unusual ratios . I wondered if earth was the correct relative reference point. Maybe the reference point should be the sun? or maybe the reference point doesn’t matter and any reference will yield a phi relationship? what is the significance of …0.0025? Does this relate to phi or something else>? you have called Venus/earth a secondary pair>? Oh!! Just as l was logging off and shutting down l noticed another common number in the matrix results.. Ok Better!! THe other number is ~ 400 !! It’s the reciprocal of 400, as you’ve now spotted. Which just happens to be the number of days on the Earth-Jupiter synodic period. Good work indeed. I’ll include that obs in the paper I’m writing just now. I won’t argue over half a day in 400, but we’ll keep it in mind, as it may be significant. I suspect Saturn has something to say in that matter. Venus rotates backwards relative to the other planets, and as I said on the Venus rotation slowing thread, this is likely to be because Venus is trying to fulfil a 1:1 with both Earth and Jupiter, turning her face towards them when in conjunction. She can’t do that by spinning the same way as the other planets. OK. Glad that matrix came in handy. What is the 4332.589? I gather that is the Jupiter year in days? Yes your work with oldbrew on the Venus opposite rotation sounds good. Hope you publish that info as well ..
Hopefully 2morrow l will matrix earth and Mars. You resolved them as a couple to 233( a fib number) but this is the fib number l had trouble plotting on the Pascal triangle exercise. If I were you I’d work on Earth Jupiter next. Mars is probably a compromise orbit resulting from whatever happened near the asteroid belt some aeons ago. Looking forward to your analysis TB.!! weathercycles, I looked at you matrix and I think I see where is not making a whole lot of sense to you. I am going to assume you really don’t really understand where these numbers are all coming from to create the 144 Fibonacci, so excuse me if you do already know. All you have basically done in that matrix is ending up with the ratio of the the ratio of rotations to the ratio of the orbital periods and the inverse of that. But those are never going to lead you to the 144. It goes like this and in this case with Earth’s rotation being the unit of one (exactly one day to rotate) it makes it super simple. Take each Fibonacci number 2,3,5,8.. and multiple that number by 0.4135 days it takes Jupiter to rotate, compare just the fraction portion and if it’s very tiny, you have a possible match but if and only if the integer portion plus the fib(n) you are using for Jupiter is also another Fibonacci. At fib(n) of 63 for Jupiter times 0.4135 you have 26.05, close, just 0.05 residual, and 63 + 26 IS 144, another Fibonacci. How far off? 26/26.05 or a 99.8% match. When one of the two rotations are not integers it gets a bit messy but you can always scale one to be exactly one to simplify the math. For Jupiter and Earth there is an even closer match at 698 + 289 = 987 and there are more even larger but TB is right that with that many rotations you begin to just see, in a sense, noise making it match closer… the close yet smallest match is best if there is really something like a gravitational harmonic synching them, a resonance. If they can’t synch at 69 revs why would they then synch at 11 times more revs. OTOH, remotely possible is the fact they very closely match at a huge number of different pairs of numbers each of these could reinforce each other, working as an entire package of pairs at the same harmonics. I don’t know, I’m rusty on harmonics. It is another Fibonacci number though (89). Of course it isn’t, ahem. Right, that’s the 89 case. but not at Ju-Ea. Looks like I need to re-read. Sorry all! Google only found this ( 4/2 waning crescent 28.68 days) found in this info? , 4/2 Waning Crescent ~ 28.68 days….???? 144 / 28.68 = 5.021…. Significance of 5 here? Thanks wayne for your input. Are these simplified ratios some sort of harmonics? I think the mercury/Venus pair resolved so well to phi is because the simplification of the ratios resolves also to a phi value of 5 . But not sure how to describe exactly what that connection is? if there is a connection? This indicates some harmony at 72? Looking for a match in rotation numbers, 2835 Venus and 11747 Mercury are close (I make it under 6 minutes in 1886 years). 2835 x 116/28 = 11745, so 2 ‘extra’ Mercury rotations are needed, and 5866 x 2 = 11732, so it looks about right to me. 270 venus / 691 Mercury = 0.391 . 270: 691 to equal 34:21 ? 2835 = 21 x 270 ?? 21 X 270 = 5670? Maybe the 28 is just simply 28 rotations of venus (243 days) from the data from the venus mercury couplet? Thanks, error corrected to say ‘2835 x 2’ etc. Reciprocals equal? Venus:Jupiter = Jupiter:Venus? Here is the result for the Venus / Jupiter , Orbit/rotation , ratios to ratios. Not sure if continuing this exercise is fruitful? Maybe getting back to the primary pairs at least…. Because they both relate to the same thing: rotation periods. Is the solar cycle linked to the number 11? is the halecycle linked to number 21? Sorry I don’t have answers to all those questions, but 21 is a Fibonacci number. As the 11319 figure is an average it may not point to anything specific. Btw there’s a bug on your ‘planetary pairs’ graphic. Half of 58 is 29 not 28, which makes 29+7=36 not 35, and then 36 x 4 = 144. 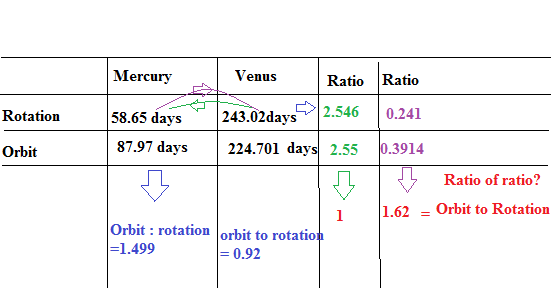 Rotation/orbit ratio for Merc/Venus is 1.6221785 according to my calcs, which converts to 1.625 (13/8) by using an adjustment of 576/575. Note that 576 = 144 x 4. This is just ‘looking behind the curtain’ so to speak, and seeing Fibonacci patterns. It could be a long process to get a fuller understanding. Good luck with your publications..
TB, OB: I just returned from vacation and now have to catch up with your impressive piece of work (including all the above comments and references, also to valuable earlier posts here on the blog). On a beach towel I had some time to unhurriedly consider the following: let us be concerned about the definition of planetary orbit and I mean its duration per single or multiple unit (and thereafter also be concerned how this relates to planetary rotation). 1. we cannot use (sorry!) any sidereal point of reference, since different planets cannot pass the very same star at their own (always) mutually different orbital duration. Moreover, the observer would always have to take the suitable geometrically neutral location (honestly, it cannot be the armchair in the ivory tower), and this is dependent on Earth’s momentary rotation and axial tilt. 2. the synodic point of reference is mathematically related to the sidereal point of reference and so it suffers from the same obstacles (and the armchair would stand on the orbiting planet, shudder). 3. what remains is the perihelion point of reference, and that sounds like a feasible idea (since we have computers and astronomical perfected model data, from observations, and software). 4. but at any rate (sorry again!) our reference+measurement system was constructed to depend on the definition of the starting point of orbital revolutions: and this was defined to depend on the momentary axial tilt (vernal equinox point) and rotation of planet Earth. The net effect is that one cannot uncritically use the planets’ orbital lengths without ‘correcting’ them by the Earth’s advance of the equinox (increasingly significant over increasing number of centuries, and a hurdle for my research back into ancient times). I’ve already checked the above for years 1500-2100 from Mars to Uranus, (re)constructed the heliocentric longitude of all their perihelion points, and assure you that I cannot assess the longitudinal precession which they all exhibit(ed) during this unpretentious date range: was this caused by the advance of Earth’s mathematically defined vernal equinox point, or was this caused (or, double shudder, mixed in) by/from the precession of the respective planet’s advance of perihelion. I wouldn’t trust the corresponding text book ‘definitions’ unless the original observations can be replicated on demand; according to experience all to much religion and astrology is standing in the way (example: even the serious scientist copy-edits uncritically that Claudius Ptolemy already had the number of days to one lunation exact except at the least significant decimal: may I ask by what this was ‘scientifically’ compared other than by pontifical A ?= A). But I need to solve the orbital duration problem for my pet model, anyways, either by verifiable explanation, or by elaborating the necessary maths+models, or by access to more recent (space probe) data points. tallbloke said (September 14, 2013 at 12:54 pm): Seriously though. I’m interested in any gravity only explanations for Venus spinning one way while it’s atmosphere spins the other people care to offer. That’s a very good one 😎 I think I “just” have to write down my proposal 😉 but this can take some days (and I’m occupied by other matters for some time). Hi Chaeremon. Glad to hear your beach towel got some use. Lots to consider in your comment, but for now I just need to correct an error I made. Venus’ atmosphere does not spin oppositely to the planet. I misunderstood when I read it spins prograde. It does, but with respect to the planet, which spins retrograde with respect to the other planets. More soon, busy writing up a paper. You might find this of interest if you haven’t seen it before. 47600 is not divisible by 3 so it seems this equation does not break down any smaller. Keep on with the investigations. @oldbrew: bookmarked the diagrams, thanks! but this work on jupitersdance should be taken with the necessary dose of salt: mathematical conjunctions and precession of ecliptic position (e.g. line-of-apse) are at the level of distance which belongs to fiction / illusion and fact / observation. My concern pertains this question: if the solar solar activity (~11 yrs, etc) can indeed by influenced by the planets’ forces, then (and because pairs of planets have (at least one) distance smaller than one of their own solar distances) I would like to see same or more impact of planets on each other (say, over several centuries or millennia, much greater than units of ~11 yrs). You deviate from the match with Venus if you add 1 to the Jupiter figure. Saying that it’s only 9.925 hours extra and it then divides by 27. But the exact multiple of 34, which is the point really, is lost. TB can probably answer your query better than me, but I’d say that planets orbit the Sun so the Sun can’t be compared to a planet and vice versa. There is software on the internet allowing you to view the relative positions of planets over periods of several hundred years. It’s not a mystery AFAIK. My question remains. Given the # of significant digits (precision) you’re dealing with, you cannot distinguish 46700 and 46701. 0.88 hours difference in nearly 54 years – about 1 minute per year – is close enough for the comparison IMO. @oldbrew: thanx for the hints, but meager 😉 centuries are not really my caliber (unless I want just a quick shot). My “quality” range begins at 7kyrs and can go to 26kyrs (usability was double checked by an independent team), and only occasionally out of curiosity I go up-to 80kyrs (with seat belts and other cautionary measures). In case you are interested in numerical integration of highest (available) ephemeris data you might want to give Solex a try (appeared in a peer-reviewed journal, implements flood of feedback from astronomers as well) and the examples (linked) on that page are interesting to know about. Regarding the number of days you are dealing with: forget about text book precision unless you want to see a shadow of one body right on another body (like: eclipses, solar transitions, you know what I mean). All planets return at an arbitrarily earlier or later date (think about week length), as seen from Earth (we have only this critical, essential reference point), and the averaged mean (mathematical, fictitious, illusory) number of days in text books say next to nothing for orbits in observable reality. The intention of this figures was to be comparative with the Kepler and Newton mathematics for education and norm (which is a good thing in principle). But for orbits in reality you always need, in addition, a (manmade!) calender system (e.g. the vernal equinox) and more than just a few pivotal observations to be able to assess things like effective planetary conjunctions over non-trivial time frames (like we do here with the many observed climate cycles in the premises of you work). Please don’t get me wrong now, I’m supporter of your model and approach (you guys’ enormous work has already forced me to add the unaided-eyes observable planet cycles to my pet model, by no way a nobrainer for a one man show alone). Let me pay back a dime by pointing to pitfalls which I already sat in (occasionally for many years of brainstorming any way out). I would like to be wrong, see any mistake in occurrences or duration here? Think Chaeremon has a point, but no point from what we are dealing with here is significant without the precise data being used and most of what I have been using so far is not very accurate. Don’t know what data Solex uses but I downloaded the package and will look for that as I get time. Synods are many orbits and many synods just make it much worse. Any small variance in the underlying data values get multiplied many times over and the errors then become significant. Rog and oldbrew, that was my suggestion earlier (may have been in an email) that we probably should pick a standard such as DE-405 or 406 or similar so everyone is on the same page at least, even if that data is then rounded to so many less digits when commenting on it or in a post. Not really sure how many digits in NASAs Horizon data is significant either, eight, twelve, the entire eighteen digits? Can’t imagine that they know such perfect accuracy though they carry full precision to minimize round-off error. This is just a simple misunderstanding. When we refer to ‘the model’ this is a factor of 425/422 greater than the expected ‘real’ data. It’s just a way of spotting ratios, not the true number of years. If we take 4660 and reduce it by 422/425 the result is 4627.1058, so now we’re less than 2 years apart. Thanks for taking the time to investigate, we welcome peer review. Hi Chaeremon: Oldbrew can explain his model at greater length, but just to say the 20 years for J-S isn’t a causal rounding up of the real figure. It is the real figure multiplied by a precise fraction which also shows up elsewhere in the solar system calcs. So the difference always gets allowed for and brought back in at the end. It just makes mental arithmetic and estimation easier while considering various inter-relations. It would give a precise number of (sidereal) earth years (of 365.256 days) after 9×4629 years = 41661 years, which is around the period of Earth’s obliquity cycle, and the interglacial period prior to the shift to ~100,000 year interglacials around 1.5 million years ago. It is noticeable that these interglacial periods are in a ~3:5 ratio. It would give us an overly precise estimate for the precession of the U-N conjunction cycle of 3640.2815 years. OT: next time I expect you experts 🙂 anticipate my mistake (or that of other readers also in some years from now) and put ordinary figures in the commoner’s base of reference beside your mental figures. Back to present business: please give me, from your point of view, the 1-2 handful of essential relations (in the format like the one I used above) and I respond with the same analysis, for everyone to see+compare, and if possible commented+(de)mentalized by you. And, what would you say that I in your work have to look for compensation of orbital positions of the apparent 422/425 offset? tallbloke said: This can’t be right for the U-N synodic period. I think I don’t get this. What is wright, what is wrong, what a mistake, what not? Did you mean that NASA can’t have the correct figure, because … ? This would require me to shoot their ephemeris data to the Moon? Perhaps I’m just lost in a language rift. Did you consider that the first full Neptune orbit was impossible to observe before 2009 and that nobody here and now can even think about observing the 2nd orbit, for comparison to reality, during her/his lifetime. You mean year 1993 minus year 1993 is no meeting (I wrote: occurrence) when in fact it is? B.t.w. your updates hammer on my mind, am I responding to the extended post? I think you made a mistake by counting the 28 datapoints you produced as 28 synodic conjunctions when the first one should have been your ‘zero’ starting point. We are not experts, and we do very much appreciate your different approach. The question of eclipses brings in a different kind of precision in the real cosmos which can inform our thinking. I will get the relevant document link for you in a few minutes. It describes the maths underpinning the DE14 ephemeris. Chaeremon: sorry for the edits, I don’t like to make too many separate comments. They are both occurrences of conjunction, but for our purpose of calculating cycles, you can’t count both the start and end points in the total number of conjunctions, or you get one too many.Think of it this way, if you added another set of conjunctions next to the first set, and counted them all, would there be (according to your method) 56 or 57, with the one in the middle being counted twice because it is both the end of one set and the start of the next? @tb who wrote: Regarding NASA’s figure and the length of time of observations … using the integrating formulae. Thanks for clarification to me English foreigner. Cannot agree more, was also my thought when earlier I looked for reasonable reality observations as base for any time frame. And thanks for the link. I suggest it can be left as is (may save headaches), perhaps attach ‘theoretical’ to the figure if necessary for calcs or comparison. @tb (your 2nd comment same thing), if you add 1 to no conjunctions you get 1, and if added to the previous n you get n+1. Same if you use m instead of 1, then you get n+m (your set is n, your other set is m). There is no double because I use the word distinct. There may something behind your counting which slips through my grasp, but I suggest you reduce your method to the commoner’s expectation. And no, “my” counting is not my method, we use it in computer programming and I have not invented it. Found it, we may have confused each other (err, assumed different priorities) with duration of the last occurrence. I can adapt, NP for me. You please stick to whatever your line of thought was. Gotta have hot brew from crunched pre-digested beans now. ‘The model’ as we call it is described in Why Phi part 2 under the heading ‘The Big Picture’. We use it to try and show synodic relationships (ratios) more easily, but always using the ratios with the real numbers afterwards. So it’s used here as a maths device. I get 171.38928 with those figures. In the model the ‘inflated’ value of U-N is 4660.4/27 = 172.6074. The difference between those two results is about 2.5 hours. Your figure of 10476.421 also appears in the same position on the Jupiter-Venus graphic. You can select which standard Solex has to use, run by run, and I use DE-421 (it also offers DE-406) on which is does numerical integration. What would be more reliable and accurate with the present knowledge? I’m really interested in alternatives, for comparison, so if you have or use something else please post. NB Saturn’s rotation period is not 100% reliable because ‘nobody knows’. Solex reports J-S happens 1464/06/25 and also 2199/06/21, 2199 – 1464 = 735 years. The elapsed time from first to last (astronomical date) is 72855.21276 – (-195585.40002) = 268440.61278 days, and to 735 years this is (sanity check #1) 365.225~ days to the year. Close enough for a match during same week. Both J-S also happen to meet near the same heliocentric position (near 329.3° longitude, perhaps only to me interesting but that’s my sanity check #2), that is: each close to its full orbit. @tallbloke: the opposite turn of Venus’ atmosphere. Can we say clockwise for the direction of sunset and counterclockwise for the direction of sunrise (found this somewhere in a Venus article); this would also work in a galaxy near you. As to your question on: why? I have a cybernetic model in mind like your 32 metronomes find. It depends on negative feedback (supposedly cause of wide-range stability phenomena like in amplifiers). Say that all planets managed to impose their force on each other (sometime and somehow), then what could hinder arbitrary, but momentarily dominant cliques to throw out or bully the losers (this picture was inspired by the observable cliques in 32 metronomes, also by the conjectured clean up of asteroid orbits). It is here that (for us) strange behavior and appearance of Mercury and Venus (maybe also Mars, its huge apse diff and loss of atmosphere) enters the game. IMHO they buffer and work off the torque of the bulling cliques (hey, Albertian relativity unrenewed for Mercury perihelion ‘proof’ 😉 including the thrust of interplanetary and extrasolar particle winds (etc), and this has consequences we can directly observe at the planet level. One (meager argument) observation is Earth and its perfectly tamed companion, they (and/or the relayed bullies) seemingly impose their part on the already discussed ratios by/with the bullied group. Caution: I know from experience that astronomers don’t like to see a connection between Luna and Mercury, but there it is. OK, This is a big problem for me. Chaeremon: “Solex reports J-S happens 1464/06/25 and also 2199/06/21, 2199 – 1464 = 735 years. The elapsed time from first to last (astronomical date) is 72855.21276 – (-195585.40002) = 268440.61278 days, and to 735 years this is (sanity check #1) 365.225~ days to the year. Close enough for a match during same week. My Emphemeris software (Alcyone – based on JPL DE404) shows 2258-11-23 – 1464-06-25 = 794.4 years and 40 J-S synods for the return to the same longitude. 3 more synods than Chaeremon gets. @tallbloke: warm welcome in the mathematical (unobservable) Astronomy Pit, new tourists please don’t skip the line and wait for clear directions from our friendly staff. Visitors who brought a surplus of candles speak to the Elucidation officer first, all other need to register for the safety training for proper handling of matches. Rationale. Nobody can test validity of ephemeris data and, at the same time, validity of software implementation. This problem is conjectured to be in class NP if you know what I mean, and a plague for us software “wizards” since the beginning of time (err, every reboot of our computers). For the problem at hand and assuming someone can replicate your discrepancy result independently (Alcyone output versus Solex output, resp. unknown differences between DE-421 and DE-404) if google university doesn’t know then tourists are left alone, may be try to get not bitten by the predators in BAUT forum or similar. What I often find is that software authors implement an opinion (a.k.a. freedom of speech) for what a calendar system is about (and how catholic it must work), but this is only my first guess here. Rog, are you sure that Alcyone runs and reports proper heliocentric coordinates and proper calendar dates? Can you switch to purely astronomical dates? I use a separate tool (CyberSky) for checking catholic calendar dates (there is a papal discrepancy which often receives bad software implementation). I haven’t tested Alcyone since their help line didn’t respond to my friendly request for information (my credo: no support for it = never think about using it). B.t.w. I have more to say about the fate of Solex and about its author, but this can wait for when we have more time. Repeat: please people here post what astronomy software they have or use (some were already mentioned earlier and elsewhere) for comparison. TIA. Hi Chaeremon. Alcyone is very comprehensive. I recommend you download the trial version and have a look. There are a lot of options for output. @tallbloke: I had the same impression when I saw the plenty of screenshots and output options, looks comprehensive but this doesn’t mean I was able to assess quality or accuracy. But sorry, one programmer doesn’t support an other programmer if the latter does not respond to friendly questions by email in Internet age. Over the years I’ve written post-processing programs for Solex output data files, they can filter & combine & visualyze, and prepare columns as spreadsheet input for x/y scatter plots etc. Limited only to my fantasy and my spouse’s willingness to brew me another one. Watch your inbox: planet Earth and its simultaneous phases of precession, everything just scaled linearly form raw data and viewed against the stars as inlays in one bracelet: the black bracelet background is min/max apse, the inlay position in the black ring is the line-of-apse. In our (manmade) reference system the equinox and solstice have been carved in mathematical stone, that is: the line-of-node (green) does not move in this bracelet exemplar (same to blue antinodes) along the 360° but you should see that also for Mercury, Venus, Luna and/or combinations with other planets. Subject of this exemplar: general precession at home over thousand of years (just three snapshots at pivotal epochs for pictorial comparison, very comprehensive level I think). Also sent a 2nd subject: the waltz of Mercury and Luna (not wanted by astronomers, perhaps due to Albertian relativity maths dogma), very harmonic that is in plain sight (and related to your work with Phi). Truly some amazing results in the rotation data. I started rearranging Waynes table of planetary pairs tonight. Wayne does not include Pluto/eris? Are there any other fib numbers for this pair? Makes you wonder why the lowest fib number for primary pairs is so large? Is the earth /Mars pair the’ backbone’ of the FIB structure. It seems more versatile having 6 ! Fib number options !! Jupiter-Saturn followed by Uranus-Neptune are the ‘backbone’ of the planetary system due to their size, especially Jupiter (318 x Earth’s mass). Note also re Earth/Mars there is a question about the sidereal orbit period and length of day. oldbrew said: Note also re Earth/Mars there is a question about the sidereal orbit period and length of day. I think the NASA fact sheet does not give every figure for proper calculation, some figures must be known to exist and obtained from elsewhere. In my example it was about the Moon for which I missed the number of stellar days (YMMV for this named quantity); it’s equivalent to rotations per lunar orbit (not just the usual days this and days that). Fortunately, web author James Q. Jacobs made insightful tables and explained the relationships between the many distinct concepts, look at his table 1 and table 3 for working examples. I think you won’t find the figure 27.396462 on wiki-plagiarism-pedia or on NASA fact pages, and perhaps this quantity rotations per orbit is missing for your calculations. Thanks Chaeremon, I’ll look into that. I just found something else unexpected so I’m a bit distracted at present. Chaeremon when you say “I think the NASA fact sheet does not give every figure for proper calculation” maybe you could help JPL list some more digits of precision, that would never hurt. I noticed them giving quite a low number of digits. But still this seems not a perfection science per se. Pluto/Neptune are accepted to be in a 3:2 resonance but the ratio is really something like 3.02. What I am saying is these are “close” relations, not perfect relations so I have deemed the four digits adequate to help Rog along. Got some preferred data? You show us and the deviances to the data, od the work, lets say in comparison to SPICE used to manage most space probes rather well (but I really think that detail is not necessary at this point unless you have plenty of spare time to do so for us, it would be appreciated). But list it here instead of just many links. wayne said: Got some preferred data? Wayne, I’m coming from another angle. What I do is, to get hands on a few pivotal observations which can be checked with Celestia or Stellarium (or similar), and then use nontrivial cycle lengths from the present work on Phi and try to match them – again in the sky and by date (week would be Okay for me). And I want to base the match firmly on the precision of existing ephemeris data. Chaeremon, I didn’t gather that from your comments, my shortfall, sometimes reading far too fast with limited time to get the proper essence. That make what you have been saying much clearer. Thanks. It appears to be 3:2 but as wayne says it’s not quite that. 3400:2262 is still not quite 100%, but they never are. The mathematics of orbital resonance theory states that the period of the disturbing force needs to match (or be in a simple whole number ratio to) the period of the disturbed body. When it is, the power of the disturbing force can rise without limit, but in reality, the disturbed body will alter it’s orbit as the power rises and so escape the gaining energy before it becomes catastrophically destructive. I think this is why quite a few of the planetary relationships we have been examining show near but not exact whole number relationships with other nearby synodic timings. But there will still be a transfer of energy, because the body is finding a balance point between the orbit it would naturally fall into, and the power of the disturbing force pushing it away from that orbit. Point taken Rog. There’s also the fact that there are always more than 2 bodies ‘in play’ so to speak. For example Neptune has to balance with Uranus as well as Pluto.